With sleep filled eyes, I stumbled to my favourite chair, coffee in tow this morning to read my bible and write. I had no idea what I would blog about, as the go and do of the holiday season has sapped from me any intelligent thought of late. 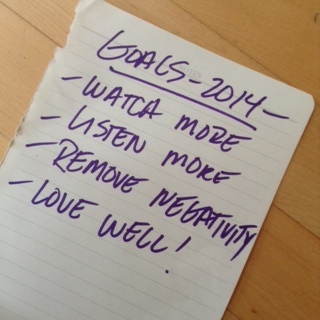 And there it was, a goal list my husband has been working on for the New Year. Watch More; Listen More; Remove Negativity; Love Well. Eight simple words that spoke volumes to me… How well do I do any of that myself? As I follower of Christ, I am called to be prepared to give an answer for my hope (in the salvation of Jesus) in season and out. I am to seek Him and seek others to share His hope. I wondered how often I am “watching” for others who could use a smile, a kind word, a helping hand. Instead, I find myself rushing from one task to another, looking to get to the end result of my to-do list. How many opportunities have I missed to love someone through Christ? Have I side-stepped sharing my faith with others because it can make for an uncomfortable interaction? Have I looked beyond someone’s need because it didn’t fit into my schedule? I am praying that God will open my eyes to see those who are unseen and to give me a heart to respond to them as He would. Years ago someone told me a story about a friend who had lost his wife to cancer. They had two small children. He was overwhelmed and bereft with a soul – ripping grief. The friend went to him but had nothing to say that could assuage that kind of pain. He just sat with him, saying nothing. After a few hours, the friend got up to leave. Listening is a gift I can give others, as everyone who has ever lived wants to “be heard” and validated. In listening to others (without thinking in parallel of what I am going to say next), I am opening pathways for understanding to have deeper more meaningful communications. Years ago I received some sales training. I was taught you can only “ask for the business” when you have earned the right. That right only comes from listening and establishing trust in relationship. The same tenet applies to life. I am praying that God will give me ears to listen to others thoughts and hearts. It is only then can I can earn their trust and “ask for the business” whether that means sharing Jesus or shutting my own mouth and offering the friendship of just Being there. This one really convicts me. Let’s face it…the holidays can be really stressful. I am not even talking about the to-do lists. I am mostly referring to complicated relationships. Christmas gatherings bring about all kinds of dynamics with friends, families and colleagues. The heightened expectations of the season, the unnaturally forced gatherings, the command appearances can steal joy and Jesus away from me. Couple that with unresolved issues, negative histories and it is a formula for disaster and at the least – a snark fest. If I am focusing on the negative, that means I have allowed the positive in my life to become blurry. Last night, my spirit was very restless. I heard in my head the scripture, “Out of the mouth speaks the overflow of the heart.” Well I confess there has been a bit too much overflow from this dark and aggravated heart this Christmas season. Due to time demands, I have not spent enough time with Jesus and it shows. I am praying that God will forgive me of my hard heart and reign me in AND reign in me continuously. I must consistently capture every thought to Him, and the only way to do that is to spend more time with Him and be cleansed by His Spirit. It is not coincidence I think that this fourth goal comes in that order. If I can practice all that is noted above, the result will be to love well. Love the ones who are easy to love, yes but also love the “sand paper” people. I have written about them before…those that rub me the wrong way and leave me chaffed. When I desire to love better, I am not talking about the sappy, emotionally-charged love of a Hallmark card. Jesus calls us to love each other as we love ourselves. But the problem may start there. If I do not love myself, I surely cannot love others. In Christ, I must realize that He created me – therefore there are no mistakes, I am just as I am supposed to be. That gives me the liberty to love myself – vagaries and all. I am not perfect but God’s plan is so I can accept the way He made me and enjoy the process while He refines me. That also gives me the freedom to love others, even the tough assignments. For me, being unloving may look like this, “it’s not you, it’s me.” It is the often conflict of my head, heart and history that threatens success. Loving well is my hardest goal and an hourly struggle. What may start out as a feeling – ultimately is a choice. If I allow circumstances to rule me, I can easily be double-minded, feeling one thing now and another later. That is conditional love – which is not real. Fortunately, God gave humans the capacity to love in various ways; storge, philia, eros, agape. (In the interest of the brevity of this post, please click here to learn more). So I have decided to adopt what my husband wrote for his goals and pursue them too. But this I know, only through God’s leading and pruning will I be able to see more, hear more, ignore the negative, and love well. I am praying that 2014 (and beyond) will be the year that the impossible will be possible. ← Must Christians Believe in the Virgin Birth?